Becca’s Sugar Cookies are the best and our guest just love them so we will share the recipe with you. At Star of Texas Bed and Breakfast, we like to serve little special treats to our guest when they arrive or on the second day of the visit. 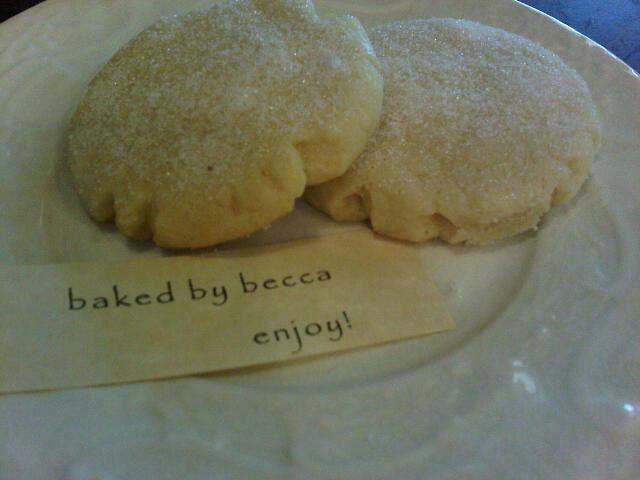 Becca loves to bake, so they get treated with lots of homemade goodies. In a mixer with a paddle, beat the butter about 1 minute, add one ingredient at a time by the list up to flour, mixing on medium until each one is blended in. Stir in the flour, baking soda and salt all at one time with mixer on low. Refrigerate for 1 hour or freeze 15 minutes. Use an ice cream scoop or what ever size cookie scoop to drop the dough on the parchment lined cookie sheet about 2 ” apart. Use the bottom of a sugar dipped glass to press flat to 1/4″ thick. Bake 8 to 10 minutes till light golden. enjoy!